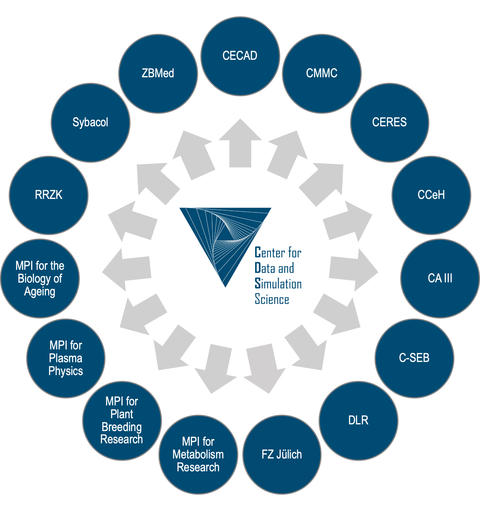 The CDS serves as a central hub for data and simulation science in the Rhineland region, by making use of the particularly dense network of excellent research institutions in close geographical vicinity. Its members have strong ties to neighboring universities and research institutes of the Research Alliance Cologne as well as strong international collaborations. While excellent research constitutes the main pillar of the CDS, its mission explicitly includes innovation and knowledge transfer. To this end, the CDS will interact closely with the planned UoC Innovation Center and regional industry partners. As questions relating to the societal implications of big data continue to spark the public debate, the CDS will also play an active role in science communication and will participate in the public dialogue with stakeholders from society, politics and economy.